Membership is open to all who bear the name of Stewart (Stuart, Steuart or Steward),or who are Stewarts by birth or descent as well as those septs or families associated with the Stewarts. The objects of The Society are philanthropic, historical, genealogical, and to further kinship. We are very happy to be going to Elgin in 2019 for our Gathering on 7-9 September. You and your friends and family are most welcome to join us there for an excellent weekend celebrating our Stewart Heritage. For more information and to book the Stewart Gathering 2019 or contact the office for a booking form. We have reserved some rooms at the Royal Hotel contact them directly to make your booking. You can see previous Gatherings in our photo gallery. Please renew your membership now. If you do not do so by the 30th of April 2019 then your record must be delted. Please don't lose touch with us! Renew your membership now. The easiest way to renew your membership is the online Stewart Society Membership Form When you fill out your form check all your details are up to date and if you don't already please consider getting the newsletter by email. If you are unsure whether you need to renew or how much you need to pay email the Secretary Jenn's email. The Stewart Society, in conjunction with our partner organisation, Fèis Rois, would like to invite entries for a pipe tune competition. We are inviting composers to write a pipe tune that is inspired either by someone who bears the name Stewart or by some aspect of Stewart history. There is a prize of £500 and you would be invited to join the Stewarts at their Gathering in Elgin in September to play the winning composition. For more information and an entry form, contact The Secretary . 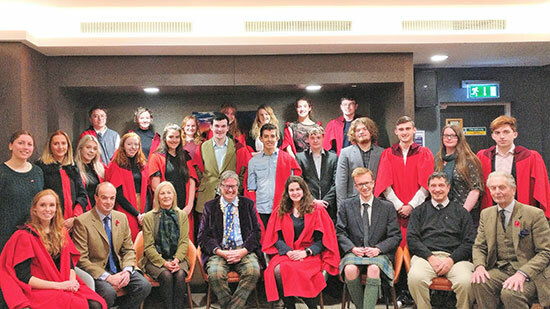 We were very pleased to meet the St Andrews Bursars for 2018/19 in an informal ceremony on the 6th of November 2018 at the Student Union. The Stewart Society was represented in force, by the President. Geordie Burnett Stuart (centre) , John Lansley, Lord Stewart (to the right of the picture); on the President's left, Lady Stewart and Aubyn Stewart-Wilson. These magnificent portraits of Duncan Stewart of Ardsheal and Appin and his wife, Anne Erving by John Singleton Copley are now on loan to Scone Palace, Perth and can be seen there in the Ambassador's room. The University of Strathclyde have provided some very interesting results relating to individuals who share the same common ancestor - including Walter, the High Steward. Read more about the Bannockburn Genetic Genealogy Project and how to go about your own DNA test. The results of the Big Y test for a documented male line descendant of Sir John Stewart of Blackhall & Ardgowan, d. c.1412, an illegitimate son of King Robert III, have now been received and analysed. Alex Williamson, author of The Big Tree http://www.ytree.net/ has identified a new SNP carried by this individual, which has been given the name ZZ52. Our two other Big Y test results, that is one for Earl Castle Stewart, a descendant of Robert Stewart, Duke of Albany, and the other for a documented descendant of Sir John Stewart, Sheriff of Bute, do not carry this SNP. Robert Stewart, Duke of Albany, and Sir John Stewart, Sheriff of Bute are both brothers of King Robert III. This means that ZZ52 must have occurred in Robert III or one of his male line descendants. In other words, ZZ52 is a distinct marker identifying descendants of Robert III. The next Council meeting is on Tuesday 30th of April 2019. The 2018 report to the Council is now available on members' download page. The AGM is on the 7th of September 2019. More details and booking form in February 2019 for members. You should have received an email with more details. Please get in touch if you have not received a booking form and you would like one. Meet at 10.30am at the visitors' centre. Want help looking for your Stewart ancestors? Want to know more about the real history of tartan? Who wore what and when? How the Stuarts used tartan to help them with the Jacobite cause?